Writing here that I hate KFC coleslaw (which seems to be almost foodie mantra) would probably get me disowned by my dad’s side of the family. It would also be a bold faced lie. I love that stuff. Alone or on top of one of their golden biscuits soaked in the coleslaw’s juices. I’m making myself hungry just thinking about it. Hungry and desperate for a good family gathering with little buckets of sides; cousins and aunts and uncles all around me. This slaw is completely different though. It really shouldn’t even be in the same food group as KFC’s slaw. 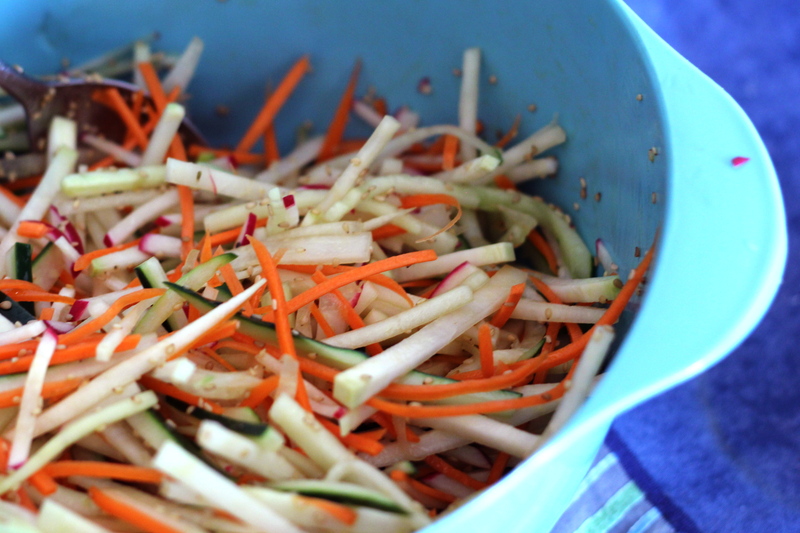 In fact, the citrus and the carrots are the only ingredients that overlap, since this slaw isn’t a standard cabbage slaw. No, the base and inspiration here was ‘cabbage turnip‘ a.k.a. kohlrabi. I brought some home on a whim and then wondered what on earth to do with it. What do people do with kohlrabi anyway? It almost looks like it came from another planet, the stalks shooting up haphazardly probing our atmosphere, or perhaps sending satellite feed back to Planet X.
I don’t know what others do with their alien probe vegetables, but I’ve used mine for slaw. Over and over and over again. Unlike the fast food, Kentucky (well, “Kentucky”) version, this one is light and vibrant with a satisfying crisp and subtle flavors. I haven’t tried it on golden biscuits, but I loved it in place of lettuce piled atop a veggie cheeseburger. And in the continuing story of me eating things straight from the refrigerator, this makes a good savory snack when you get a craving a couple hours before dinner. I changed the recipe units from cups to vegetables, since I don’t want to do any spatial reasoning when making sloth slaw. Even so, the recipe is more a guideline than a true recipe. Use what you have on hand. I found grapeseed oil to be a really nice substitute for sesame oil, which I didn’t have. Whisk together oil, lime juice and ginger and toss with julienned vegetables. Add sesame. Season with salt and pepper, if necessary. This just makes me even more excited for August 6! !